At age three, here is a little list of what Em loved. As you can see, board games were a huge hit in our house. 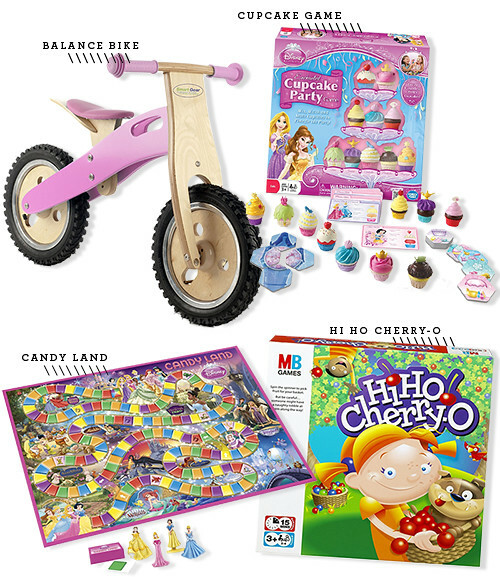 Candy Land – She was given the princess edition. You can also find the classic edition . Hi Ho Cherry-O – A fun way to encourage counting. Cupcake Party Game – This was by far Em’s favorite game. She’d play this every single day. Balance Bike – We loved this bike. It was the reason Em was able to learn to ride a training wheel free bike at age four. 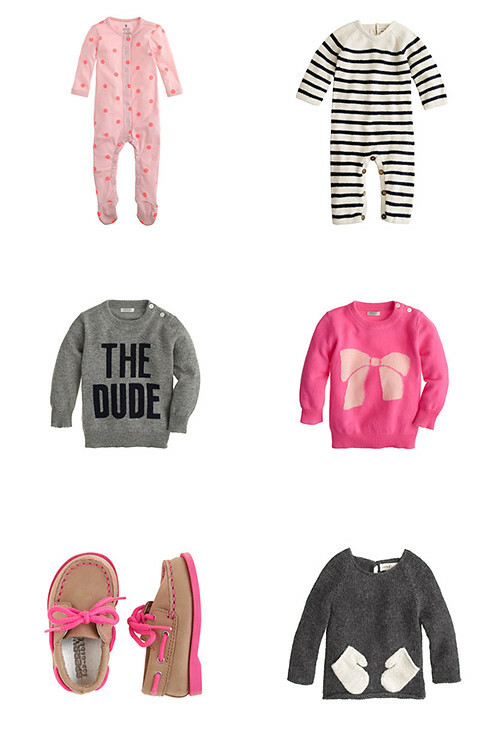 Some favorites from the J.Crew baby line. Stripes, bows, dots, oh my! How was your Halloween? We lucked out and the rain stopped Halloween morning. 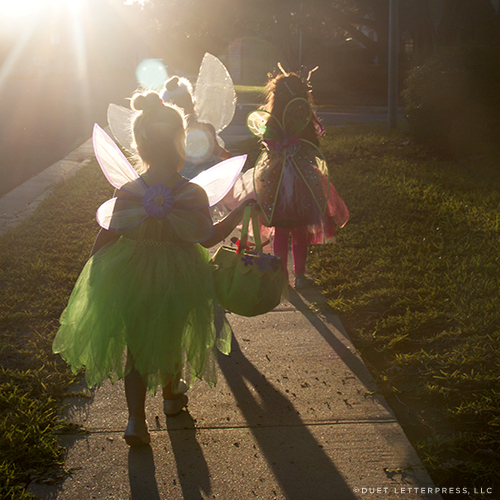 Em + her dance friends were all fairies – Periwinkle, Tinker Bell and a woodland fairy – and went trick-or-treating together. So cute!! Here’s what Em loved when she was two and a half years old. 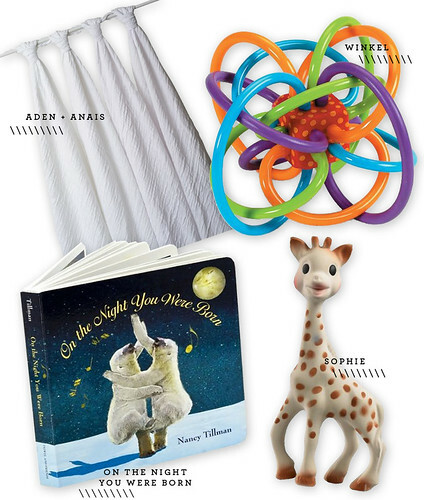 She also loved a few big things like her trampoline but these are smaller items that are priced nicely for gift giving. Doctor Set – This is a great set with lots of fun things inside. Matching Game – There are many versions of this game. For boys, I like gifting the superhero set . 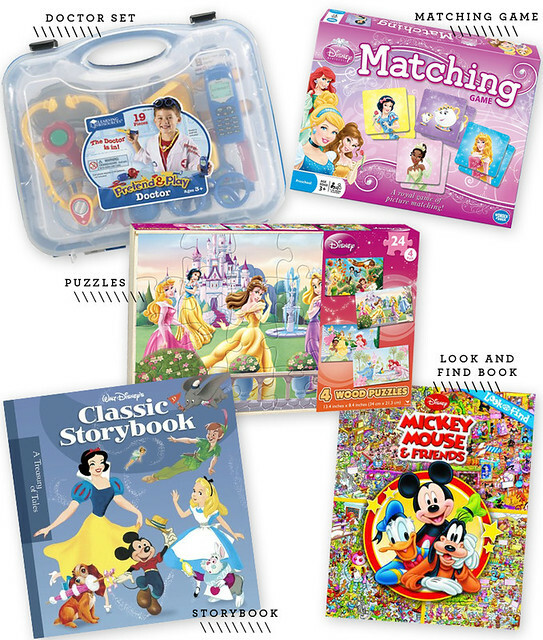 Storybook Collection Books – We got this book on our second trip to Disney. I fell in love with the vintage graphics. It’s a beautiful, thick book with gilded pages and it contains seventeen short stories. Again, there are many versions including a Christmas edition and a superhero version . Puzzles – Four wooden puzzles are included in this set and they are all contained in a divided wooden box. Look and Find Books – Em loves seek and find books. This is her absolute favorite. At two and a half years old, I think she read it daily. Here’s what Em loved when she was 2 years old. She also loved a few big things like her Magical Castle Dollhouse but I wanted to focus on the smaller items that are priced nicely for gift giving. Moon Dough - Like Play-doh but doesn’t dry out. Crayola Washable Markers - She loves coloring with these. AquaDoodle Classic Mat - Like painting but without the mess since it just uses water. Cloud b Twilight Constellation Night Light Lady Bug - She enjoyed bringing this ladybug into the dark bathroom, flipping on the colors and searching for the moon. I think it helped her not be scared of the dark [yet]. 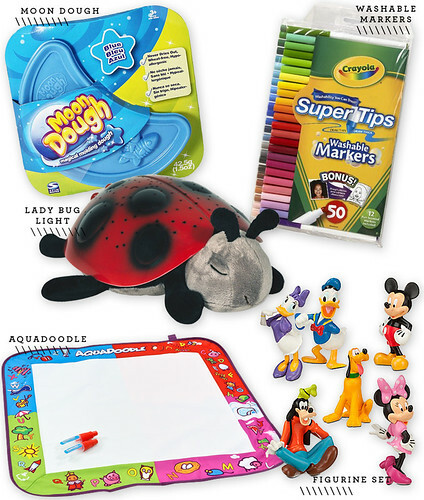 Mickey Mouse Clubhouse Figure Play Set - Em plays with these and her Disney Princess Figure Play Set in her Castle. She puts them to sleep, wakes them, and feeds them dinner around the dinner table. Now that it’s Christmas time, she puts each of them peeking out of the window looking for Santa. Because Em’s birthday is in the spring, she was about 18 months old around Chirstmas time. These are the things she loved. Around 16-18+ months, coloring was a real hit with her. 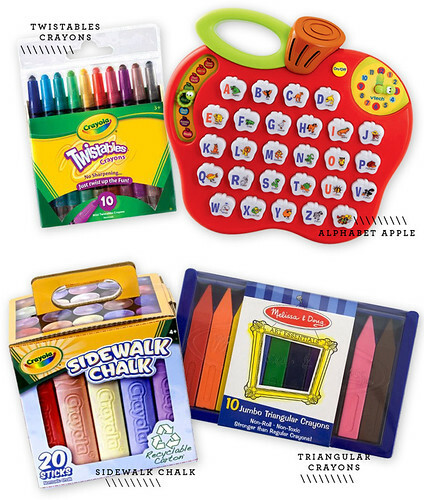 She loved this Crayola Sidewalk Chalk Bucket , these Melissa & Doug Jumbo Triangular Crayons and these Crayola Twistables Crayons. We got her a huge roll of white butcher paper so we could place a long sheet on our coffee table for her to color. She also was gifted this VTech Preschool Learning Alphabet Apple . At 2.5 years old, it’s still her favorite game in the car. It has a ton of settings so that it can grow with your child. These are the things Em loved when she was one. She also liked big things like her water table but I wanted to focus on the smaller things. The things that are perfectly priced for gift giving. 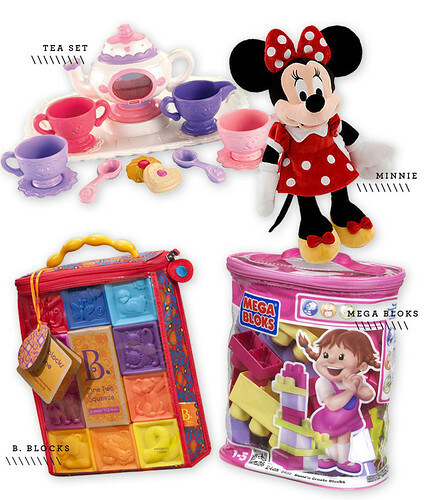 Fisher-Price Magical Tea for Two - She loves playing tea party and this tea set has everything she needs. 8″ Minnie Mouse Plush - Em loves her Minnie + Mickey dolls. She’d take them on a pretend picnic, feed them a pretend lunch and serve them pretend tea. B. One Two Squeeze Blocks - These blocks were great both in and out of the bathtub. They have different things on each side so Em used them to learn her numbers, colors and animals. Mega Bloks Maxi - Like legos but for toddler hands. Em is the oldest in a circle of friends. The little girl next door is a year younger. And a friend of ours has a little girl a year younger too. So, when it comes time for holiday + birthday giving, I usually gift them something that Em loved when she was their age. I thought I’d share with you some of Em’s favorites + my go tos for gift giving. First up, her newborn favorites. Aden + Anais Swaddlers - I’ve blogged about these before. We love the big 47″ square ones. In the early days, we used them as swaddlers. Then nursing covers. Now with Em 2.5 years old, we use them as sheets. Manhattan Toy Winkel - This was the first toy she could use on her own. Thanks to the loops, she was able to grasp it easily. On the Night You Were Born - Hands down, my favorite book. It was given to us my Em’s aunt. It’s such a sweet, sweet story. I’ve teared up many a time reading it to Em. Vulli Sophie the Giraffe Teether - A classic teething toy. I’ve gifted Sophie many times including this variation .